Indonesia pledged to further support Ukraine's territorial integrity. In the course of the state visit to Indonesia, President Petro Poroshenko had a meeting with the speaker of the People's Representative Council, Ade Komarudin. 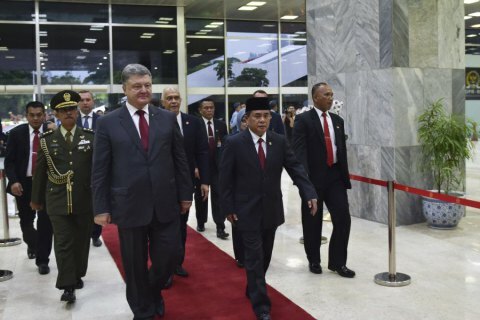 According to Poroshenko's website, the parties praised the prospect of developing partnership relations between Ukraine and Indonesia in political, trade, economic and humanitarian spheres. The head of state expressed gratitude to Indonesia for supporting the territorial integrity of Ukraine. Ade Komarudin emphasized that Indonesia would further support Ukraine's territorial integrity and state sovereignty. The president urged Indonesian MPs to protect the rights of Crimean Tatars severely violated by the Russian occupying authorities. The parties agreed with the necessity of enhancing interparliamentary relations. Ade Komarudin supported Ukraine in its aspirations to accede to the ASEAN Inter-Parliamentary Assembly.